* This is my article in BusinessWorld last February 08, 2017. Almost everything we do now requires energy and if we stay in non-mobile structures like buildings and houses, everything requires electricity. Energy precedes development so unstable and expensive energy means unstable and poor economy. Given the technological revolution the world has experienced in recent decades, it remains a tragedy that many countries still have low electrification rates and very low electricity consumption per capita. Unfortunately, the Philippines is among those countries with still not-so-high electrification rates until today and its electricity use is among the lowest in the ASEAN (see table). Electricity consumption in kWh per capita is high for the following developed and emerging Asian economies: Taiwan, 10,460; South Korea, 10,430; Brunei, 9,550; Singapore, 8,840; Hong Kong, 5,930; Malaysia, 4,470 (6.5x of PHL); China, 3,770; Thailand, 2,490 (3.6x of PHL). These countries and economies also have 100% electrification rate except perhaps China. There are two reasons why the Philippines has a relatively low electrification rate and low per capita electricity use. First is due to its archipelagic geography. Many municipalities and villages are located in islands that are off-grid and, as a result, their residents rely on biomass like firewood for cooking and gensets running on diesel for lighting although some do use solar. Second is due to politics. There are not enough base-load power plants that can provide electricity 24/7 even in major islands like Luzon and Mindanao. This is because of political opposition by certain groups to cheap and stable fossil fuel sources like coal. Also, there are many bureaucracies (national and local) that discourage the quick construction and commissioning of new power plants. There are also weak, inefficient, and even corrupt electric cooperatives (ECs) that are given monopoly privileges to serve certain provinces and municipalities. There are 119 ECs in the country from Luzon to Mindanao plus private distribution utilities like Meralco and those in PEZA/ecozones. All ECs are supervised and regulated by the National Electrification Administration (NEA). Of the 119 ECs, some remain financially weak and problematic until today, like the Abra EC (ABRECO) and Albay EC (ALECO). These two ECs are so deep in debt they are unable to provide stable electricity to their customer-members and have arrears with power generating companies (gencos) that supply them electricity at the Wholesale Electricity Spot Market (WESM). According to National Electrification Administration (NEA), from 2004 to 2014, it has released subsidies to ABRECO worth P56.6 million for the implementation of the Sitio Electrification Program (SEP), Barangay Line Enhancement Program, and its procurement of a modular generator set. For ALECO, it was badly managed and was on the brink of bankruptcy that local business and political leaders proposed and supported its corporatization and take over by more established energy players. In January 2014, ALECO was acquired by San Miguel Energy Corp.’s subsidiary Global Power Holdings Corp. (SMC Global) and renamed it as Albay Power and Energy Corporation (APEC). ALECO then was the first EC in the country that was corporatized. Upon takeover, SMC Global and APEC inherited a P4-billion debt by ALECO including overdue payments at WESM of nearly P1 billion. More than two years after the takeover, the debt ballooned to P5.6 billion, mainly due to low collection efficiency. APEC said its database of customers has been sabotaged since about 80% of its customers are not on the database. APEC resorted to disconnecting some big customers that do not pay but disgruntled ALECO employees and officers have resorted to reconnecting them. The ball and accountability is in the hands of NEA. Why are these things allowed to continue for years, to the detriment of paying customers and generation companies that are not paid on time. In 2015, NEA reported that it lent a total of P2-billion loans to 51 ECs to finance their capital expenditure projects, rehabilitate their power distribution systems, among others. NEA should perhaps consider slowly stepping out of the sector and push all the ECs to move towards full corporatization with full exposure to expansion or bankruptcy. The sector that needs protection should be the electricity consumers, not the ECs. Consumers should be protected from expensive and unstable electricity as well as disconnection because the DU or EC has been disconnected by gencos and WESM for huge unpaid accounts. 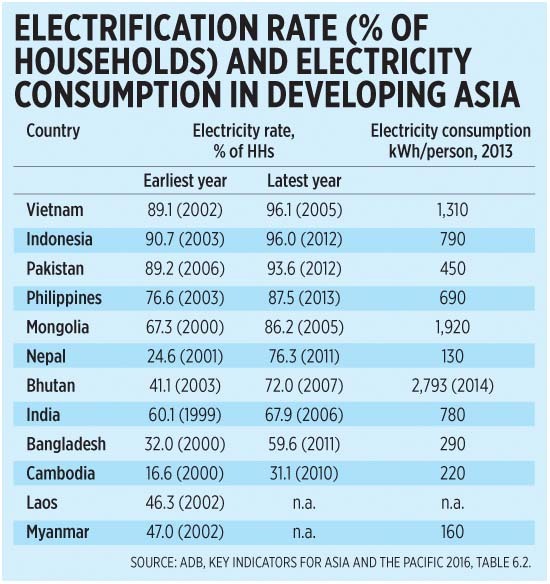 The NEA, along with other government agencies in the energy sector, should look at the above table again, and try to find out why our electrification rate and electricity use are at the level of Pakistan and Mongolia instead of at the level of Thailand, Vietnam, and Malaysia. Bienvenido Oplas, Jr. is the President of Minimal Government Thinkers and a Fellow of SEANET and Stratbase-ADRi.